It was at a meeting in the Public Hall of Callander on 27th September 1889, that a group of businessmen at the request of 'certain visitors and others' decided to form a golf club. Old Tom Morris (St Andrews) advised on the layout of the course, then located at Muir of Gart, 2 miles to the East of the present course and Old Tom was invited to attend the official opening of the Club on the 7th June 1890. Although popular, the location just outside of Callander, made it prohibitive for visitors to play, so a new location had to be found. In 1892 a new location was found on the sight of the present course. This was ideally situated as the new course with its elevated site providing majestic scenery, was now located just 500 yards north-east of the railway station. With no time lost, nine holes were duly prepared once again under the supervision of Old Tom Morris. In September 1913, the Town Council purchased the course and additional fields in order to extend the course to 18 holes. Willie Fernie from Troon was engaged to advise on the new layout of holes. The new 18-hole course was officially opened on the 20th June 1914 by Mr Daniel MacEwen J.P. The bogey (par in today's terminology) was 72, whereas now it is 66. The oldest trophy in the Club is the Challenge Cup (Gents Championship), first played for on 27th September 1890, exactly one year after the initial meeting, sowing the seeds of the Golf Club. The winner, A Morris Stewart, scored 142 - 10 = 132 for 18 holes. Changed days where 132 is usually the two round aggregate for the top qualifier in today's Challenge Cup! In February 1924 John Shannon from Troon was appointed the club's first Professional. Off and on through the years, other Professionals have held this position. Durham Burt was one of these Professionals whose knowledge of golf helped to produce the outstanding golfing talent of Gordon MacDonald, who went on to be capped for Scotland on a number of occasions in the late 1970's and early 1980's. Others have followed Gordon in to the international arena. George Barrie also had the honour of representing his country in the early 1980's and Ben Collier in the 1990's. 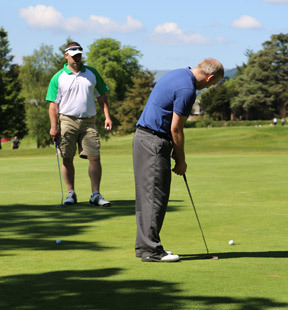 Callander Golf Club has done well to produce three golfers of International standard. It is a true testament of the respect many golfers have at Callander for the memory of Durham Burt that since 1980, a memorial trophy is competed for annually, with the winner becoming Gents Handicap Champion. The foresight of the Professional and businessmen in 1889 has given Callander a true test of golf and a golf course still enjoyed and admired to this day, by members and the many visitors from around the world who play the Course year on year.